Thirteen years after the orange Gates of the Bulgarian art giant Christo bloomed in New York City’s Central Park, the Bulgarian-American artist Kiril Jeliazkov is dressing the U.S. Capitol in splashes of bold color. 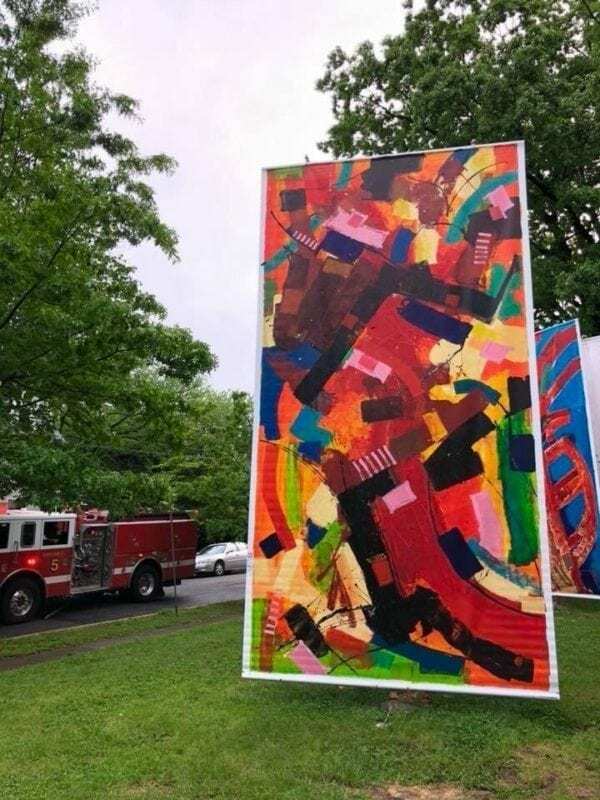 One hundred and twenty-eight gigantic, striking original abstract-painted canvases now grace Washington, D.C.’s parks and gardens, stretching from Embassy Row through Dupont Circle to Rose Park in Georgetown. The sun brings fire to the bright palette of orange, reds and yellow; the recent rains and cloudy skies calm the blues and the greens; the trees, grass and natural landscape liven up with an infusion of color. Children play among the canvases, cyclists make a stop to imbibe the beauty, picnickers relish the backdrop – nature and man come together in harmony through the gentle touch of art. The Orange Step is Jeliazkov’s first large-scale open installation of original paintings, 20 x 10 feet each, produced on 2,624-feet of vinyl and stretched on frames towering 23-feet into the sky. A traveling exhibit, Washington D.C. is the fifth stop around the world for the Orange Step, which set off on its journey from Jeliazkov’s hometown of Yambol, Bulgaria in 2006, and has been on the road since. Perhaps not coincidentally, it reminds the artist of his own journey, from the Academy of Fine Arts in Sofia, Bulgaria in the 1990’s to the Savannah College of Art and Design, (where he completed his BFA and MFA in painting in 2007) to his travels around the world in Africa and Latin America, which have inspired many of his art collections. Jeliazkov talks to Artrepreneur about The Orange Step. AV: What is the artistic concept behind your monumental artwork, its creative mission? Kiril Jeliazkov: The vision for The Orange Step is to inspire, unite and provoke people to not be afraid to dream big, take chances and be the painters of their own Life. Same goes for creatives and their Art. AV: This is one of the first times such large-scale original art is taken out of the context of the traditional gallery. Why did you choose Nature as the medium to showcase your work? Kiril Jeliazkov: It is an old adage that nature is the best artist. Everything lives in aesthetic harmony in Nature. I am inspired by nature and my goal was to create a man-made Art project that would harmonize with it. I wanted to keep the format of expression of the traditional oil or acrylic painting, but display it on a hyperbolized scale, under the open sky, in parks, botanical gardens and on natural terrain. Depending on the settings in which I place my painted canvases, the artistic rendition is different. Nature is part of the art, but the art interacts with nature as well. The paintings rotate and are moved by the wind. The rain washes and intensifies the colors. The sunrise and sunset create different color plays. The Orange Step is really art and nature in ONE. In displaying the canvases outdoors, the art also reaches everyone. I wanted to break the conventional ways of displaying original paintings only in closed spaces like galleries and showrooms. AV: In contrast to the outside art projects of Christo, stationed in one chosen location, the Orange Step is a monumental original art installation that is meant to travel the world. Why did you conceive it to be a “traveling Art nomad” of a sort? Kiril Jeliazkov: I wanted to make the Earth and the World my Gallery and to share the art with as many people as possible. The Orange Step Exhibition is designed to move to different places but feels at home everywhere. Travel brings learning and growth. Every location is unique and brings the beauty of the project in a very different way. Travel is an incessant inspiration for me – it opens the mind and the creative eye. AV: The Orange Step is free to the public and seems to be art with a social mission as well…It has drawn crowds of people across age, gender, race, political affiliations and social differences, aims to do so around the globe. Did you envision your Art to have the social impact it actually has? Kiril Jeliazkov: I wanted The Orange Step to unite people – despite their differences, through the power of beauty and the uplifting energy of Art. Art is one of the most positive and reaffirming ways to reach and influence others. I also want to inspire – children especially, to appreciate and support the arts, to be creative themselves and pursue the arts. AV: You sign each of the 128 large canvases with your distinctive signature – an orange step. Why a step, orange, and why is the exhibition named the Orange Step? Kiril Jeliazkov: A thousand mile journey starts with a single step…The Orange Step reminds us of the colorful journey that our Life is, and the risks we need to take the first step. I have chosen my footprint to sign each of the canvases. It represents my own mark and path in life as an artist. Orange is my favorite color – it symbolizes passion and is the color of creativity as well! AV: What does risk-taking and innovating in art mean for you? Kiril Jeliazkov: I come originally from a very traditional background of academic art training from a European Fine Art Academy…which means my comfort zone is portraits, figurative paintings, and landscapes. The project was an escape for me from the traditional representational painting. It is an exploration of colors, shapes, brushstrokes and line qualities. It experiments with composition and tests the ability of each painting to stand boldly by itself, yet interplay with the others in different ways, depending on curation. Risk-taking in art means that we need to become comfortable with failure, with criticism or commercial flops to be able to push boundaries and experiment outside our comfort zone. Without risk-taking and innovation, the free creative spirit will become stagnant. AV: The Orange Step has also a deep spiritual meaning for you. What is its message? Kiril Jeliazkov: Take that scary journey, make that first step…without fear. The steps will connect. “A project of such scale has to answer to many requirements and specifications in regards to safety, possible damages to the environment, hazards in inclement weather, landscaping, ” says Jeliazkov. Image courtesy of the artist. AV: What were the engineering, technical and execution aspects of producing this art exhibit that were challenging? Kiril Jeliazkov: An artist is a creative, but also has to be an entrepreneur, engineer, product designer, project manager, stress-tester, strategist. A project of such size requires extensive planning on all these fronts. The art is one part of the project, the infrastructure is another. I worked with a team of professional engineers to design the structures that hold the canvasses and complete all testing that they are suitable for the outdoors. I had to be resourceful in finding the studio to produce the paintings – a basketball gym out of all places. Over 2 tons of special “weather-resistant” paint was used after lots of lab testing. I had to experiment, design and self-produce all along the way…even made myself the large brushes used in the project. AV: How does an independent artist with such a grand-scale idea accomplish the political buy-in by multiple authorities to exhibit on premier public and private grounds? Kiril Jeliazkov: The process of obtaining permits to exhibit was very challenging. It took me about two years of meetings with the National Park Service and DPR to obtain all proper permits. A project of such scale has to answer to many requirements and specifications in regards to safety, possible damages to the environment, hazards in inclement weather, landscaping. Detailed engineering drawings and 3D videos of the entire process of installing the project were used in front of the authorities. Many letters of recommendations from previous installations in different cities also. The Georgetown community was engaged to lobby for the project to the Parks services. Like in entrepreneurship, tenacity is a must in artrepreneurship. AV: How do you finance such ambitious art projects? Kiril Jeliazkov: Entirely through the sale of other smaller artworks. AV: What are the biggest challenges you encounter as an artist-entrepreneur in executing your projects? How do you overcome them? Kiril Jeliazkov: Large-size funding is a challenge. A combination of self-funding, donors, sponsors and grants can be a solution. An artrepreneur needs to knock on many doors and be resourceful in how they obtain the financial capital for a large-scale creative production. Diversifying funding sources and private-public partnerships in sponsorship are some of the avenues to explore beyond self-funding. “It needs to be versatile – mountable outside but also in large spaces inside, scaleable – to expand or contract as an exhibition on its own, also mobile, and multi-sensory. But firstly, it needs to engage,” says Jeliazkov. Image courtesy of the artist. AV: In contrast to Christo’s installation art which is ephemeral and disappears after it is dismantled, the Orange Step is art that can be commercially consumed beyond the exhibiting grounds. What is your vision for the commercial and business potential of The Orange Step? Kiril Jeliazkov: The exhibit is to be shown in public but also in private shows – on golf grounds, private estates, resorts, on the beach. It can be mounted as part of entertainment or social events, as a whole exhibition or in parts, even displayed piece by piece. All pieces are available for sale. I have interest from some celebrities in owning individual canvases or a few of them. I am also considering cutting several of the larger ones into smaller pieces and making them available for sale, to allow more people to own a small piece of The Orange Step. Part of the proceeds from each sale I donate to the Leukemia & Lymphoma Society. AV: How do you market your art as a solo artrepreneur? Kiril Jeliazkov: I market through all channels of social media. You can follow my art on Instagram @kiriljeliart, #theorangestep. I also market through my custom-designed website www.kirilism.com, through my art blog, PR and media channels, and through my collectors and sponsors. 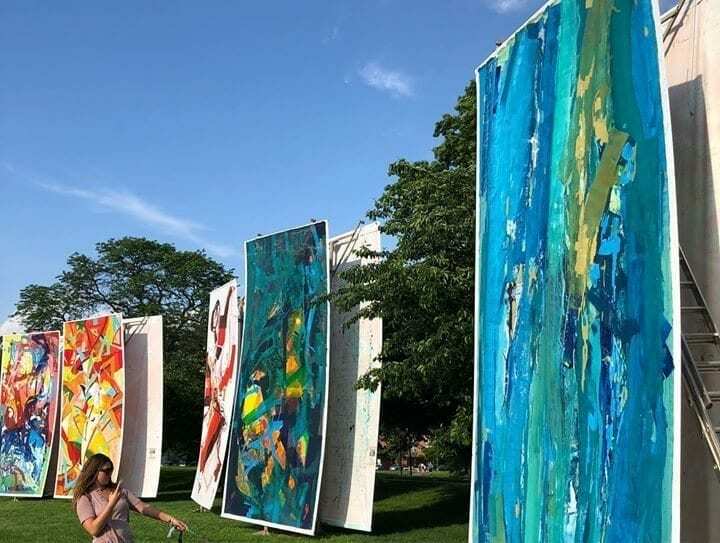 I also exhibit my art in Toolbox Gallery on Dupont Circle in D.C.
AV: What does large-scale, outdoors art need to deliver to the viewer to have a commercial potential? What is the future of nature art? Kiril Jeliazkov: It needs to be versatile – mountable outside but also in large spaces inside, scaleable – to expand or contract as an exhibition on its own, also mobile, and multi-sensory. But firstly, it needs to engage. I use different art media to build a following – drones, videos, original photography and short films of the exhibit are all ways in which I engage my audience. The closer we get to Nature, the more we care about the Environment, the more frequently we will be seeking the connection with Nature via Art. Art in Nature is a source of pure enjoyment for the viewer, endless creativity for the artist and rewards for both – commercial, social. spiritual. It is a winning combination. Anna Valcheva is a Wall Street investment banker, entrepreneur and an artist, who explores the left-right brain connection and creativity in all its forms and fields. She seeks to discover and be inspired by unorthodox people, stories and ideas that break stereotypes, push boundaries and expand our horizons. Thank you Anna Valcheva! Thank you Artprenuer!